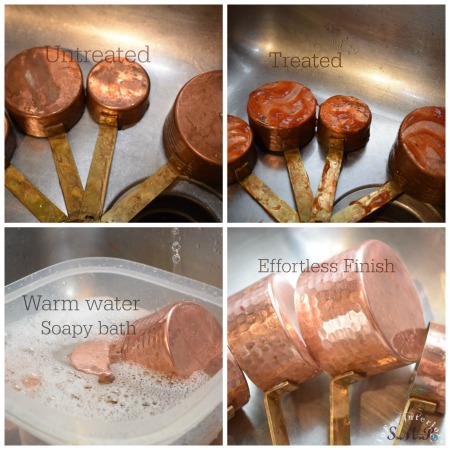 What causes patina to form on copper ? If you are a fan of copper cookware, then you may be concerned at times on how much effort it takes to keep these beautiful kitchen items looking their best. The patina in copper is simply and less technically, a by-product of the metals chemically reacting to its environment by means of oxidation, hence giving it the tarnished appearance. This process in turn will yield to the change in color of the object, usually a bluish/greenish look. Patina can also be formed on other metals such as brass. Above you will see a before view on how this copper pan and top has garnished quite some tarnish or patina over the last few months. 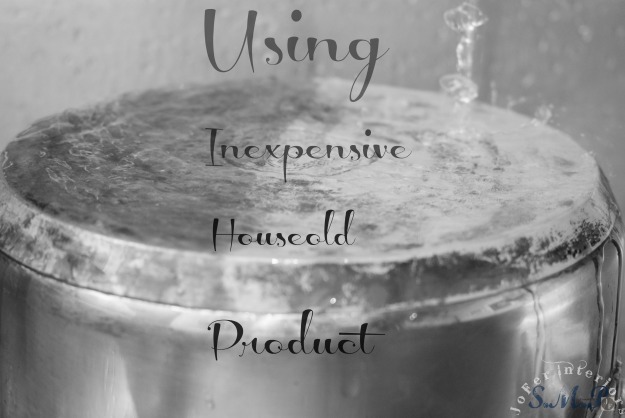 Today we will use some simple household products that you may already have laying in your pantry. 2. Use the ketchup just as is, straight from the bottle. 3.Spray the vinegar water mix generously onto the desired areas. 4. Apply a generous amount of ketchup onto the area and let sit until you can see the change in color taking place. As seen above you may notice how the treated side already looks a lighter, brighter color than the untreated area. 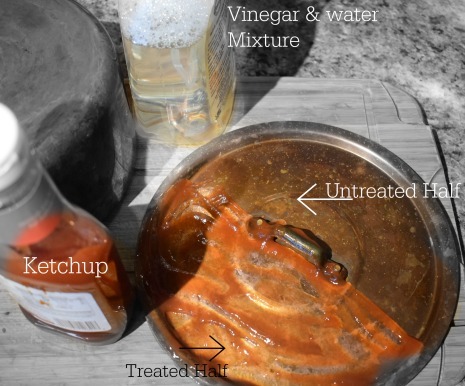 Use a rag or towel paper to wipe the treated area clear of the ketchup paste. As you can already notice above, the treated area is beginning to regain its original copper luster tone. Another heavy gauge copper saucepan with stainless steel inner lining and handle using the same method used for the cover. 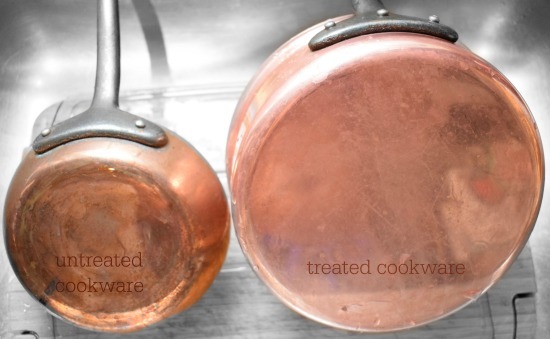 This image shows a comparison of these two copper cookware pans, one untreated (left) and the other(right)completely treated and washed. The difference is absolutely clear, almost "mirror like" clear if you ask me. Please Note: you may have to repeat the steps 2 or 3 times depending on how tarnished your pots are. 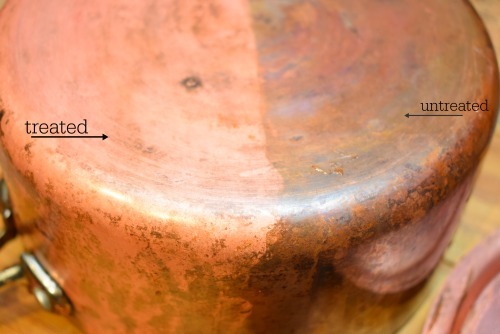 Another image of the same method used on a stainless steel pot with a copper bottom. 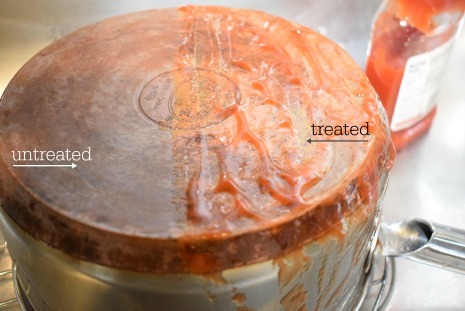 To our pleasant surprise we found that the paste also brought desirable luster to the stainless steel area of the pot. 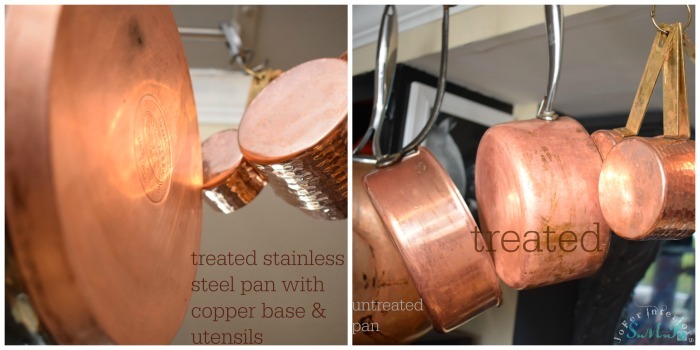 We then proceeded to repeat these steps for each copper kitchen utensil. This included serving utensils, measuring cups, copper moscow mule mugs, etc. The results were an effortless almost new look. Please note: the longer the ketchup paste remains on the item the more of the patina or tarnish it will tend to be removed. Nevertheless we learned that leaving it more than 30 minutes at a time caused the paste to stick to the surface causing you to use more effort to remove it.Again, don't rush the process, but also don't just forget about the timing factor. When it's all said and done,the paste will avoid you having to use a whole lot of "elbow grease" if you will. Some more views of the finished work beautifully hung on a ceiling utensil rack. If you look closely at the photo to the right of the collage, you will notice we hung an untreated copper pan to the far left.The other two along with the measuring cups were treated only once with the ketchup paste. The difference in color is completely noticeable. 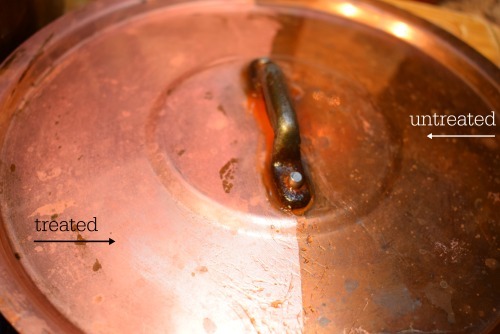 Also notice how some of the dark patina still remains on one of the treated saucepans, as this was deliberate. Conclusion: This is a matter of preference. 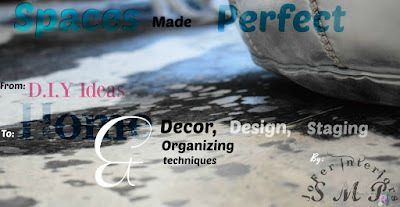 You may choose to completely remove all the patina or leave a few stains here and there. Just remember that depending on how long you have owned these, the more you will have to repeat the process. 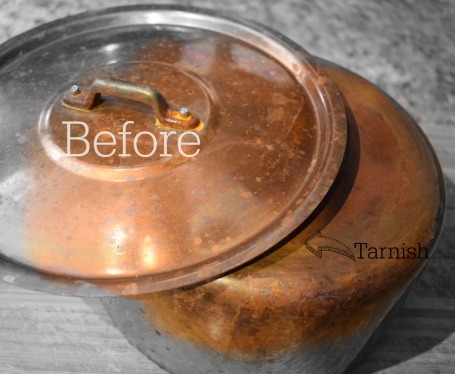 For me personally I always enjoy watching a well aged piece of copper cookware. The different shades in the patina even if you partially clean them, gives for a more interesting and or vintage look. As usual we welcome your comments and shared thoughts. CREATE IT...LOVE IT...SHARE IT!